Home Differences What is the difference between Profit and Loss & Profit and Loss Appropriation Account? Profit and loss appropriation account is an extension of the profit and loss account itself, however, there is a fundamental difference between profit and loss & profit and loss appropriation account. By definition, a P&L account or Income statement is one of the three financial statements of an organization which summarizes revenues and expenses to ascertain net profit or a net loss of the organization for a specific time period. By definition, a P&L appropriation account is used to demonstrate division or allocation of profit/losses among the owners. Purpose P&L account is used to determine Net Profit or Net Loss of an organization for a given accounting period. P&L appropriation account is used for allocation and distribution of Net Profit among partners, reserves and dividends. Made by P&L account is prepared by all types of businesses. P&L appropriation account is prepared mainly by partnership firms. Balances Profit and loss account don’t have any opening or closing balance as it is prepared for a specific accounting period. 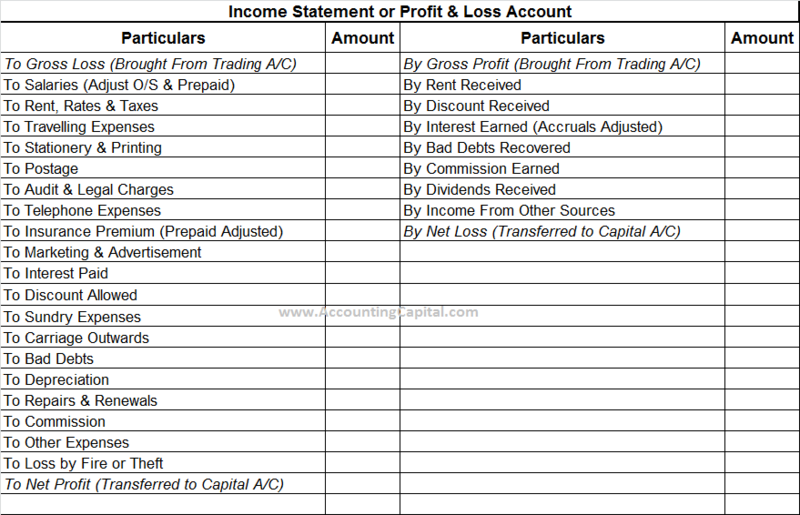 Profit and loss appropriation account may have carry forward balance from the previous accounting period. Timing It is prepared after the trading account. It is made after preparation of profit and loss account. Partnership Preparation of P&L account is not based on a partnership agreement (exception – interest on a loan from partners) Preparation of P&L account is based on a partnership agreement. Principle Matching principle is followed i.e. expenses for an accounting period are matched against related incomes. Matching principle is not followed while preparing a P&L appropriation account. Related Topic- What are Balance Sheet Accounts?